"Dr Hoyle IS the real Spiderman!!!" "I dont think 5 stars is enough for Dr Hoyle and his staff"
My mother began seeking treatment from Dr. Hoyle and has been very happy with her results! "Dr Hoyle is the best Doctor I have met since 5 years ago I came to the United States "
Dr. Hoyle has been practicing Phlebology (Specialty with Vein Disorders) for 15 years. He was the first physician in Orange County to perform endovenous laser ablations. He was also the first doctor to perform micro phlebectomy and the first to utilize tumescent anesthesia for vein procedures. He has been an invited lecturer at Chapman University and appeared twice on the TV show “Health Matters”. He has also been interviewed on the radio show “Straight Talk MD”. Dr. Hoyle is an expert reviewer for the Medical Board of California and served for several years as a consultant at the VA hospital in Long Beach. Dr. Hoyle was among the first 200 doctors in the U.S. to pass the exam to obtain Certification by the American Board of Lymphatic and Venous Medicine. He has also passed the examination for Registered Physician in Vascular Interpretation (R.P.V.I.) by the American Registry for Diagnostic Medical Sonography. Dr. Hoyle was one of the first physicians to use Varithena in Southern California. He has become a spokesman and physician trainer for the company and has given a presentation at the American College of Phlebology annual Congress in November 2017. In September 2017 he traveled to Medicare headquarters in Baltimore Maryland to discuss coverage and reimbursement for Medicare recipients. Recently he was asked to participate in a meeting with the medical director for Blue Shield of California regarding coverage for Varithena treatment. A Canadian transplant from Toronto, with a medical degree from the University of Western Ontario, Bruce Hoyle has lived and worked in Orange County, California for most of his career. He holds an MBA degree from the University of California, Irvine. Dr. Hoyle is the chairman of the ACP's Coding and Reimbursement Committee and serves on the American Medical Association's CPT Advisory Panel. He has also served on the board of the ACP Foundation. In 2012 Dr. Hoyle was elected a “Fellow” of the American College of Phlebology. In 2013 he completed a white paper for the American College of Phlebology, “Guidelines for Treatment of Superficial Venous Disease”. This document was produced mainly for the insurance industry in the hope of creating more uniformity to medical necessity for treatment of superficial venous disease. In 2015 he spoke to Medicare Administrators for 12 states regarding coverage of the Clarivein device (mechanochemical ablation). Recently he agreed to serve as an advisor to the AMA CPT editorial panel. Dr. Hoyle has traveled both nationally and abroad to several important centers to acquire the exceptional skill needed for the treatment of vein disorders. Dr. Hoyle has practiced and studied with some of the leaders in the laser vein surgery field in advanced centers of La Jolla, Phoenix, and Toronto. In 2004, Dr. Hoyle traveled to Lausanne to visit Dr. Albert Ramelet who is one of the world's recognized pioneers in the modern treatment of varicose veins. Dr. Ramelet has written a major reference textbook on the treatment of varicose veins and designed some surgical instruments used today. Dr. Hoyle has practiced medicine in Orange County for over 25 years. He was the first physician in Orange County to perform an endovenous laser ablation. He is one of a few doctors in Southern California doing ambulatory micro-phlebectomy. In 2007 Dr. Hoyle was one of a few doctors from around the country who participated in a seminar held in Houston, which was focused on the laser treatment of perforator veins and subsequently was one of first doctors in Orange County to use a laser to treat incompetent perforator vein Dr. Hoyle is a member of the American College of Phlebology and is board certified by the American Board of Phlebology. He is also a member of ARDMS with the credential RPVI® – Registered Physician in Vascular Interpretation. Enlarged hand veins are normal veins that become more visible as the skin relaxes and thins with age. They are not considered to be diseased as are protruding varicose veins in the legs. They can however, be easily injured and unsightly as the skin becomes more fragile. A combination of ambulatory phlebectomy and sclerotherapy may be necessary to treat unwanted hand veins. The two types of facial veins most often treated are the smaller spider veins and larger reticular veins. Spider veins usually appear as fine irregular red lines on the nose, cheeks and the side of the face. The larger reticular veins appear greenish blue in color and can be 2-3 mm in diameter. They are most often found along the cheekbone under the eye and at the temple areas. Reticular veins and large spider veins are best treated by ambulatory phlebectomy or sclerotherapy, while smaller spider veins are usually treated easily with LASER. Advanced Vein Center is a leading vein treatment center in Southern California specializing exclusively in the diagnosis and treatment of venous disorders including spider veins and varicose veins. Dr. Hoyle has been practicing Phlebology (the treatment of vein disorders) for over 10 years. The Advanced Vein Center and Dr. Hoyle pioneered the use of Endovenous Laser Ablation and Microphlebectomy in Orange County. All of our procedures are done in the office on an outpatient basis with the use of a local anesthetic and a mild sedative if needed. The patient is awake throughout the procedure and able to resume normal activity almost immediately. We perform diagnostic ultrasound exams in our office using a state of the art ultrasound equipment dedicated explicitly to vein evaluations. We do not refer our patients to an outside imaging center or hospital for ultrasound evaluation. We have found too often that outside sonographers are not properly trained in evaluating the superficial veins. Dr. Hoyle personally performs or supervises all ultrasound evaluations. There has been a rapid change in the last decade in the field of vein treatment technology. Here are some of the technologies used in our office. 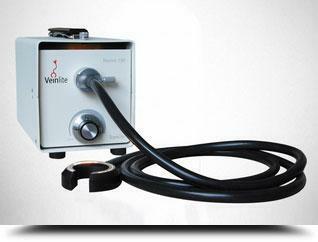 The Veinlite is helpful for visualizing reticular veins. These are dilated bluish intradermal veins 1-3 mm in size. Spider veins (telangectasias) can be hard to see with the naked eye during treatment. 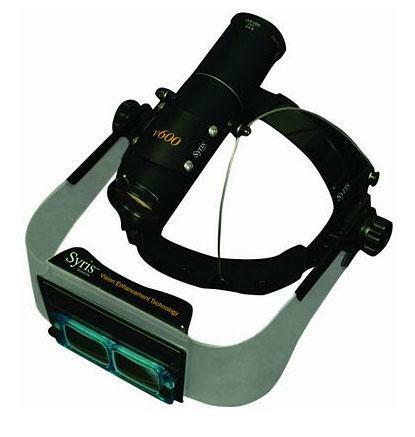 The Syris headlight uses a double polarized filter along with a halogen light source and lens to remove skin glare and magnify the spider vein. Endovenous laser treatment has continued to evolve over the last decade. The original lasers were in the 800 to 100 nm wavelength and targeted hemoglobin part of blood. The newest lasers are in the 1400 nm range and target the water part of blood. This allows treatment with 1/3 of the energy previously needed and results in none to minimal bruising and discomfort. Dr. Hoyle had the first Thermalite 1470 laser in California. Dr. Bruce Hoyle was recently featured on the Straight Talk MD podcast with Frank Sweeny. The show covered everything you ever wanted to know about varicose veins, spider veins, and chronic venous insufficiency. Please click on the Soundcloud or Straight Talk MD Image to listen! Please contact the office for complete coverage details and questions. "He is an absolute master of his craft and could not get a higher recommendation from me. THANK YOU DR. HOYLE!!!" "Don't waste your $$ or time going elsewhere, come and see a true specialist who is fast, painless, fun and get's the job done...1ST TIME!! " "The staff is very friendly and professional, every visit has been amazing. She has been recommending Dr. Hoyle to friends and family which means a lot coming from her." "I had horrible, painful veins and Dr. Hoyle did the laser ablation procedure in his office. Not only was Dr. Hoyle amazing, but his staff were amazing as well! " "My initial consultation was refreshingly educational and Dr. Hoyle was very thorough in explaining my vein issues and treatment options."